The mobile application vehicle appraisal and valuation tool from Laser Appraiser brings live, critical auction and valuation data into the hands of your mobile workforce on their Google Android and Apple iOS smartphones and tablets. Laser Appraiser, with affordable, industrial-strength VIN scanning and data precision, delivers the best tools to even the smallest, independent dealerships for competing against their largest competition. Discover the best cars at the best prices for maximum profit and rapid turnover. 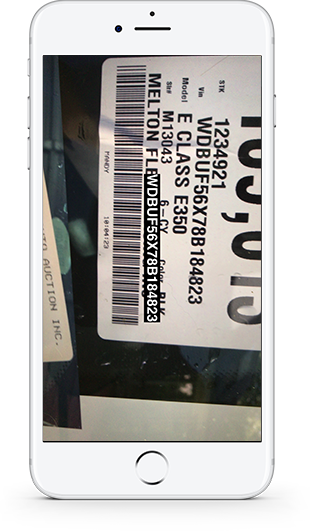 Powered by an industrial-strength, enterprise-grade barcode reader, our Vehicle Identification Number, or VIN Scanner is tuned to provide fast and reliable barcode reading on smartphones and tablets. Damaged codes, challenging lighting conditions, or harsh environments, Laser Appraiser outperforms the competition. Scan Faster - Save time with accurate results on the spot with Laser Appraiser! 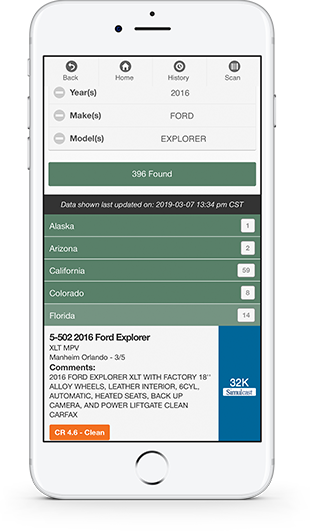 The Laser Appraiser mobile app for Android and iOS smartphones and tablets delivers expert Pricing Guides, trusted Market Reports, and detailed Vehicle Histories at your fingertips... anytime... anywhere. Combining the best features of those dedicated, single-use apps, Laser Appraiser is the all-in-one mobile solution for building the complete picture of each vehicle profile. Discover value anywhere with Laser Appraiser! Covering auctions nationwide, Laser Appraiser gives you the most accurate and frequently updated Run Lane Vehicle Lists available. Always be at the best auction and in the best lane to find the best vehicle buys that will resonate with your home town buyers. Enjoy Big Auction Savings - Know the bargains and where to find them before your competitors with Laser Appraiser! Bargain inventory leads to sales, which leads to profits... the mobile Laser Appraiser VIN scanner and valuation app maximizes ROI, building your store inventory with integration support into market-leading Inventory Management Systems. Whether it is Dealer Studio, First Look, or Dealer Track, Laser Appraiser has you covered by finding the best deals before they get into your inventory, and maximizing efficiencies after.